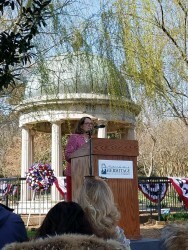 On the late morning of March 15th, Tennesseans congregated on the grounds of The Hermitage to celebrate the birthday of one of the state’s greatest historical figures: President Andrew Jackson. The pinnacle of the celebration is a traditional wreath-laying ceremony. The hour-long ceremony takes place at the tomb of Andrew Jackson, located in the gardens of The Hermitage. The President of the United States sends a wreath to be laid on Jackson’s grave every year. The Tennessee Supreme Court’s own Justice Cornelia Clark participated in this year’s wreath-laying ceremony as the keynote speaker. The keynote speaker delivers a short speech on the legacy of Jackson, his relevancy to today, and related topics. The keynote speaker is a well-known politician, author, journalist, or person who plays a role in shaping contemporary public thought. Bob McDonald, Vice Regent of the Andrew Jackson Foundation, conducted this year’s ceremony. The Tennessee Army National Guard provides a dignified and colorful military presence; and Judge Andrew Jackson, VI attends to represent the family. In addition to Justice Clark and Judge Jackson, the following individuals participated in the ceremony: SFC Brad Warren, 129th Army Band; Chaplain Major Robert Dunbar; Colonel Jason Glass, Assistant Adjutant General, Tennessee National Guard; and Howard J. Kittell, Andrew Jackson Foundation President and CEO. Following her speech, she and Colonel Glass laid the President’s wreath on Jackson’s grave, while Vice Regent McDonald and Judge Jackson laid a wreath on Rachel Jackson’s grave. The Tennessee Army National Guard provided a color guard, an invocation, a soloist to sing the Star-Spangled Banner, and a bugler to conclude the ceremony with Taps. The Hermitage hosted a day-long program with activities for children and adults. Guests enjoyed playing 19th-century cricket games on the lawn; listening to music from the Jackson era on the back porch; and interacting with General Jackson, his War of 1812 soldiers, and First Ladies Abigail Adams, Dolley Madison, and Martha Washington. And, of course, eating birthday cake!